Titanium Quartz creates a pathway for the vital life force to flow, charging the chakras. Wearing Rainbow Titanium can make us feel grounded, centered and energized. For emotional balance and healing, Aura Quartz crystals provide calm in the emotional body. This crystal is soothing and healing to the aura. 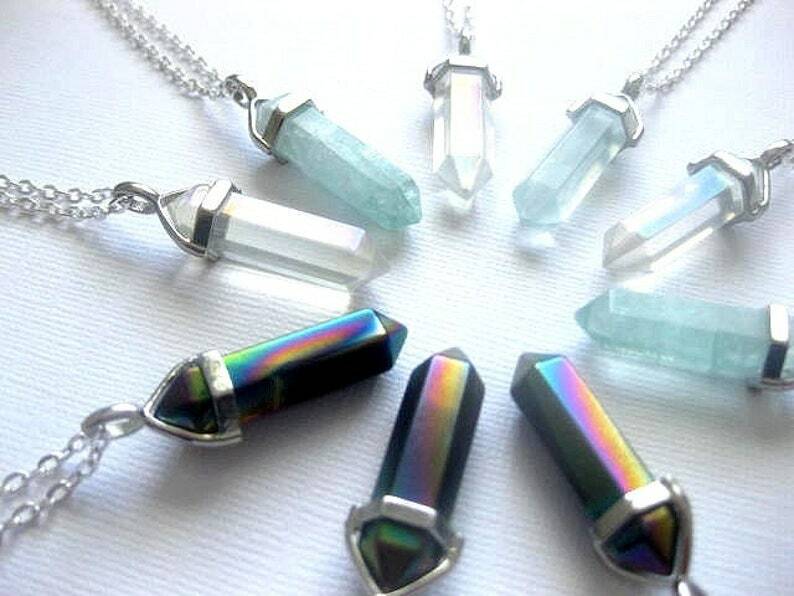 Aura Quartz help release negativity and stress, as well as old wounds and persistent doubts about one's self-worth. The Gentle healer. Green Fluorite helps to detoxify and charge the chakras. It allows healing from heart issues. Green Fluorite is said to enhance intuition and remove chaos. INTERNATIONAL CUSTOMERS, PLEASE REVIEW MY SHIPPING & POLICIES FOR SHIPPING TIMES, AND POSSIBLE CUSTOM/DUTY FEES! Thank you for visiting Fashion Crash Jewelry. Beautifully crafted necklace and pendant. My son will love this. Well packaged and my item arrived in a timely fashion. Many thanks. Absolutely beautiful necklace! Even better in person. Very pleased, will order from again. Any Returns Must Be Made and received by us Within 14 days From Date of Delivery! WE ACCEPT RETURNS, NO QUESTIONS ASKED. Upon Receipt of any Returned items, we will issue your refund. Shipping cost to return the item is the responsibility of the buyer and refund of the purchase price (minus original shipping charges) will be made once the item has been received by me. We are not responsible for returned items that may get lost in transit, unless the buyer is able to provide proof of shipment with a tracking number. All standard domestic shipping will be 1st class mail via the US Postal Service with delivery confirmation. An email will be sent when your order ships. Items will ship within 3-5 business days of payment, sometimes sooner. All standard INTERNATIONAL shipping will be first class international mail via the U.S. Postal Service. Depending on the country, and/or season, international packages can take anywhere from 3-8 weeks to arrive, but the vast majority arrive within 8-15 business days. Unfortunately, we cannot make any ship time guarantees for international deliveries. Please be patient while the various mail services do their jobs. ◘ PLEASE NOTE: YOUR COUNTRY OF RESIDENCE *MAY* CHARGE CUSTOMS/DUTY FEES ON US PARCELS. THIS WOULD BE FEES THAT YOUR POSTAL SERVICE WOULD REQUIRE YOU TO PAY BEFORE YOU ARE ABLE TO RECEIVE YOUR PACKAGE. WHEN SHIPPING YOUR PACKAGE WE ARE NOT KNOWLEDGEABLE OF THESE FEES, AND WE PAY THE COMPLETE CHARGE OF WHAT IT ACTUALLY COSTS TO SHIP YOUR ITEM. THESE FEES ARE CHARGES THAT CERTAIN COUNTRIES' POSTAL SERVICES WILL CHARGE ACCORDING TO THEIR OWN CUSTOMS/DUTY RULES AND REGULATIONS. SADLY, WE HAVE NO CONTROL OVER SUCH FEES, AND THEY VARY DRAMATICALLY, SO PLEASE CHECK WITH YOUR LOCAL POST OFFICE BEFORE ORDERING IF YOU HAVE CONCERNS. WE WILL NOT BE HELD RESPONSIBLE FOR ANY EXTRA CUSTOMS/DUTY FEES THAT MAY OCCUR.